One of the better preserved exhibition stickers – not by Jill McDonald, and I’d love to know who did do it! This was a brilliant event that for the time was pretty epic. 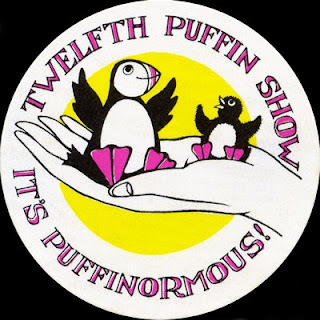 I still remember the twelfth show as being something pretty special. I met Spike Milligan at this show and had my hero worship bruised by his confusion and anger that a Half-Irish boy could have an Islamic name. He is still a hero to me, and I have come to understand his views – however uncomfortable they make me feel – RIP Spike – Greatly missed.